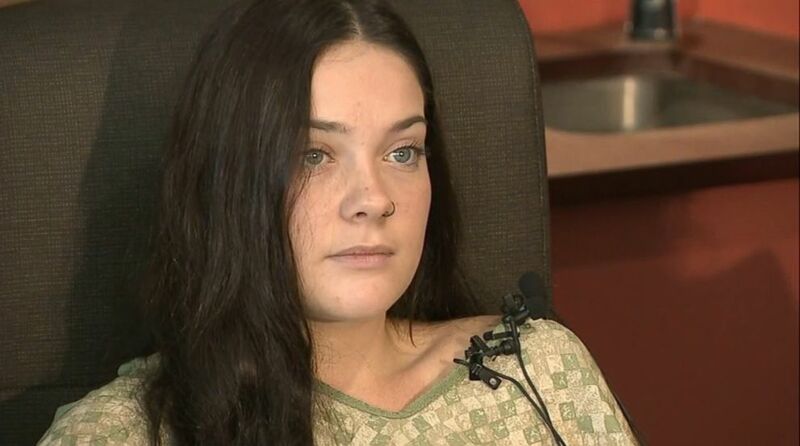 The 16-year-old girl who said her friend pushed her off a bridge into a river spoke out Thursday from a hospital in Vancouver, Washington. Jordan Holgerson suffered five broken ribs and lung injury after she was pushed off the Moulton Falls Bridge on the Lewis River outside Vancouver, a suburb of Portland, Oregon. Surveillance camera footage shows the girl was standing on a bridge ledge and was pushed off by another girl standing behind. Holgerson said she initially wanted to jump off the bridge after she saw a friend do it, ABC News’s affiliate KATU reported. Jordan Holgerson, 16, who was pushed off the bridge in Vancouver, Wash., suffered five broken ribs and lung injury. She talks to ABC News's affiliate KATU on Aug. 9. 2018. Holgerson told KATU she didn’t feel any pain but adrenaline hit her after she was pushed in the water. “And then an EMT that was off-duty helped me onto the rocks and just a whole bunch of people surrounding me were helping me, calming me down,” Holgerson said. “In the air I was trying to push myself forward, so I could be like straight up and down that make my head hit first but that definitely did not work,” she told KATU during the interview at the hospital. Jordan Holgerson, 16, was pushed off the bridge in Vancouver, Wash.
Talking from a hospital to KATU, in a chair surrounding by her friends, Holgerson advised those who are at precarious heights to be alert. “If it's that high just make sure that you know what you are doing,” she said. Even though Holgerson expects it to be six weeks before her pain subsides and six months before she can participate in sports, she told KATU that she is grateful to be alive. “I am happy to be OK,” she said.